I don't think I've ever separately reviewed a film before on the blog (though I have talked about Safe Haven in conjunction with its book review). But there was just no way that I could pass up the opportunity to gush (more) about the amazing film that was Catching Fire. While I did like The Hunger Games (movie; I loved the book), it didn't leave much more than an impression of being a strong book-to-movie adaptation. Catching Fire was my favorite book in the series, so I was admittedly worried about how well it could be adapted on screen. I shouldn't have been though, because it was really fantastic. Catching Fire completely exceeded all the expectations I had for it. The way the story plays out felt like it was new-to-me, even though I knew exactly what would happen next. The characters - the relationships they develop, the difficulties and moments of bliss they go through - just felt so real and alive. As I sit here typing this, I'm still in awe of the whole movie experience -- and quietly plotting a way for my sister and I to watch it for a second time. Before this devolves into fangirling (oh wait, it might be too late for that! ), let me give you a list of the five reasons I really loved Catching Fire. 1. The film made me want to read the book all over again. Even though Catching Fire is my favorite of the series, I haven't read it since 2011. It says a lot that the film was so good that it made me want to pick up the book and experience everything in it all over again. The story was captured so well, including what it's like for Katniss and Peeta post-Hunger Games and what the Quarter Quell experience is like for all these former victors. 2. The characters - particularly Effie and Peeta - make an even better impression this time around. All these actors and actresses involved in the film definitely brought their A game to this film, whether they were a main character or not. I think my two favorites (except for the one who gets a separate number in this list) are Effie and Peeta. Effie (played by Elizabeth Banks) was brilliant. She was still her fun, vivacious self, but at the same time, there was also an air of vulnerability beneath it, particularly at the Reaping of the Quarter Quell Hunger Games. I loved how she was able to convey how torn up she was about everything in just one sentence or one look. Peeta (played by Josh Hutcherson) was always the guy I rooted for, and this movie reminded me why. I wasn't too keen on him in the first movie, though I didn't dislike him. But I fell for Peeta in this film, all thanks to how Josh really took it on himself to bring this character to life. Every single emotional scene, every ounce of courage and strength, each moment of conviction - the baker boy totally won me over (again). Jennifer Lawrence is, hands down, one of the most talented actresses out there. 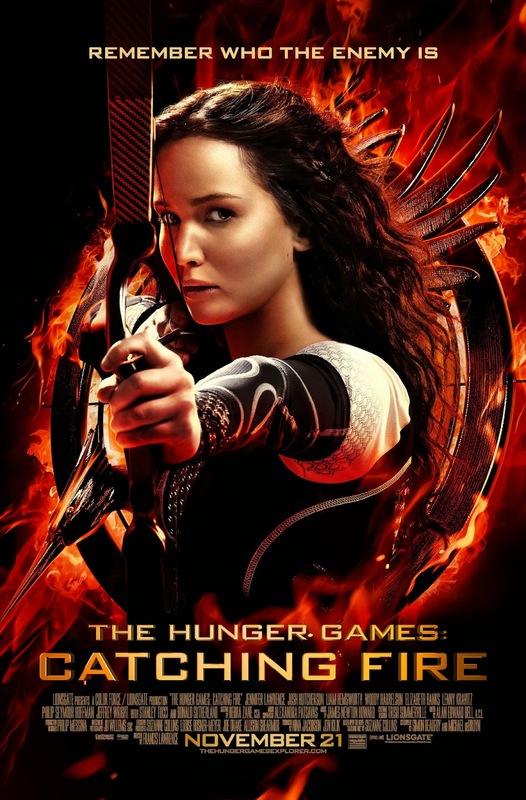 Her ability to play Katniss, who is a completely conflicting ball of emotions and moods and actions, is seriously tested in this film -- and she blew me away. Just witnessing her play out Katniss' PTSD after the Hunger Games, or discovering her feelings for Gale and Peeta and the truth of them, or watching her find a resolution within herself about who she will choose to be is totally worth going to see this film for. She's the perfect Katniss -- and yeah, I went there. I wanted to say a few more things, but I realize they might be spoilery for people who have (1) not seen the movie or (2) read the books. So I'll just leave you guys with the exact thing I texted my brother-in-law after getting out of the theater: Please read The Hunger Games trilogy if you haven't done so yet, and then watch the films. It's so worth it! I haven't read the book in a while, but I think it might have even been a bit better, I just enjoyed it so much. 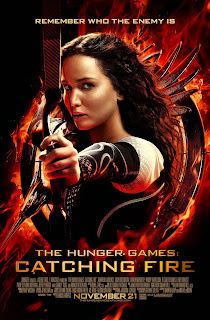 I think Jennifer Lawrence has proven that she is exceptional at embodying Katniss Everdeen in the films! She's really, really believable in this film and just carried the entire character perfectly. This was my favorite book in the series as well! The film adaptation is spectacular, and is currently my favorite of the films (even though there are only two). Hope you enjoy it when you finally do get to see it! When I left the theater after this one, I told my fiance and our friend that it was everything I wanted for this movie. They really knocked it out of the park with this one. And I completely agree about Jennifer Lawrence. That scene in District 11 makes me tear up just thinking about it. So good. That was EXACTLY the response that my sister and I had as we walked out of the theater! It was just so well-done, so perfect, and it basically just had us wanting to watch the film and read the book all over again. Jennifer Lawrence is so amazing. I have a major girl crush on her. Lol. She is so talented and she nailed the role of Katniss. She really IS Katniss. This movie was so good. I cried four times and had so many feels throughout. I want to sit in the theater and watch it over and over again. Best book to movie adaptation I've ever seen. Frankly, it's one of my top adaptations! They nailed everything - the characters, the story, the feels. Yes! I agree with everything you said here. This is one of my very favorite (if not THE favorite) book to movie adaptations. I was kind of "meh" after the first one because so much of the book was internal and that doesn't translate so well to screen... but this one just knocked it right out of the park. The first one was pretty good to me, but this second one totally blew it out of the water! It was completely surprising how much I fell for this movie, and I'm just eager to own my own copy of it when it's released. I did not enjoy the books the first time around but the movies are totally selling me on a reread! I think they do such an amazing job of embodying the characters in a way I couldn't wrap my brain around. You should probably do a re-read ;) But yes, I'm glad you understand the extent and gravity about my feels for this film! I absolutely agree with what you said about them doing the book justice with this film adaptation! And yes, Josh totally won me over with his performance as Peeta. I already liked Peeta in the book, but I love him even more now! I had the same reaction to you with the two films so far. The first was good, but not great. The second, though, was so amazing. I left the theatre very impressed. Physically I still don't think Jennifer Lawrence is the perfect Katniss (I respect her decision to not lose a ton of weight in order to be a better role model for girls but she's just too tall and just doesn't look like how I imagined Katniss does). However, her representation of Katniss' emotional and mental struggles in Catching Fire was spot-on. If I wasn't already a Jennifer Lawrence fangirl, this film would have turned me into one. I definitely agree about Effie as well. So well done. My main concern is how Mockingjay is being made into two films. Considering the book was only 300-something pages, this is definitely not necessary. I'm just hoping that they're able to stay true to the story and messages of the third book while filming these two final installments. I guess we'll see soon enough, however. I have to say, I absolutely agree with your opinion about Mockingjay. I'm not sure how it'll work with them splitting it into two films, since it doesn't seem necessary to me. I'm hoping that they work movie magic and it turns out well though! One of the best book to movie adaptations I have seen by far. I admit I was initially a bit worried about the film after there was that director problem soon after The Hunger Games came out, but it. was. perfect. The actors and actresses, the scenes, just everything! It was as if I was reading the book again and what I saw in my mind was right on the screen. It was just so, so, SO amazing. Gah. 100% agree with you! "It was as if I was reading the book again and what I saw in my mind was right on the screen." --> I agree COMPLETELY. It was well-done! AHHHHH! This movie. I wanted to see it again the second it was over. All while simultaneously reading the book so I could read certain scenes while they were being played out on the screen! I've been a fan of Josh as Peeta for a while now, but I think this movie pretty much confirmed that he is Peeta.So good! And Effie... I don't really remember her much from the books so I'm very glad that Elizabeth Banks made her so poignant in the films. Really in need of a reread of this series! The performances in this film were spot on, and I was totally convinced of the characters. This was just SO GOOD, and I already want to watch it again just thinking about it! I liked this movie much better than the book because i agree with you - the actors all did such an amazing job bringing it to life. There was so much more emotion between the victors, so much connection and subtle glances that spoke volumes, all the relationships were more vibrant and relatable. I got so much from this movie that I missed in the book which may sound bad but I love, love when movies are better than books.